"The acquisition and development of longer-range UAVs will increase China’s ability to conduct long-range reconnaissance and strike operations," the report said. China’s ability to use drones is increasing and the report said China "plans to produce upwards of 41,800 land- and sea-based unmanned systems, worth about $10.5 billion, between 2014 and 2023." 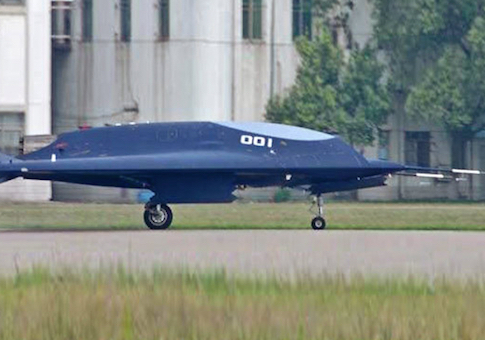 "The Lijian, which first flew on Nov. 21, 2013, is China’s first stealthy flying wing UAV," the report said. "China is working on a range of technologies to attempt to counter U.S. and other countries’ ballistic missile defense systems, including maneuverable reentry vehicles (MaRV), [multiple, independently targetable reentry vehicles], decoys, chaff, jamming, and thermal shielding," the report, made public Friday, states. "The United States and China acknowledge that the Chinese tested a hypersonic glide vehicle in 2014," the report noted. "Together with the increased mobility and survivability of the new generation of missiles, these technologies and training enhancements strengthen China’s nuclear force and bolster its strategic strike capabilities," the report said. 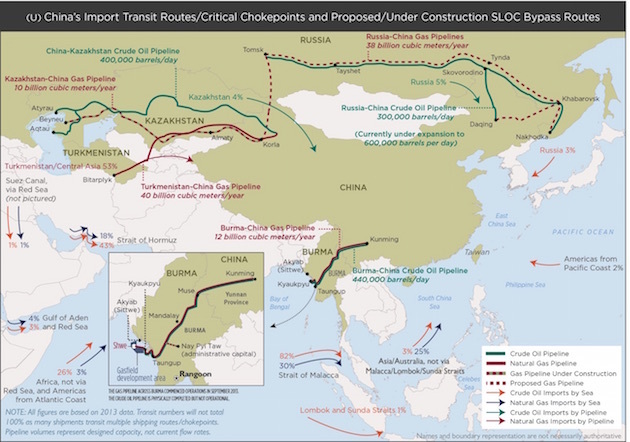 "China will likely continue to invest considerable resources to maintain a limited, but survivable, nuclear force to ensure the PLA can deliver a damaging responsive nuclear strike." "By far it is the most detailed PLA report in terms of explaining near to medium term threat vectors but does not venture enough into the far term, the later 2020s and beyond," said Fisher, with the International Assessment and Strategy Center. The report also highlights the threat facing Taiwan. "It is a tragedy that the Obama administration does not pay attention to these assessments when it continually denies Taiwan new weapons systems it requires to continue to deter China," Fisher said. "China is increasing the lethality of its conventional missile force by fielding a new ballistic missile, the CSS-11 (DF-16), which possesses a range of 800-1,000 km [500 to 620 miles]," the report said. 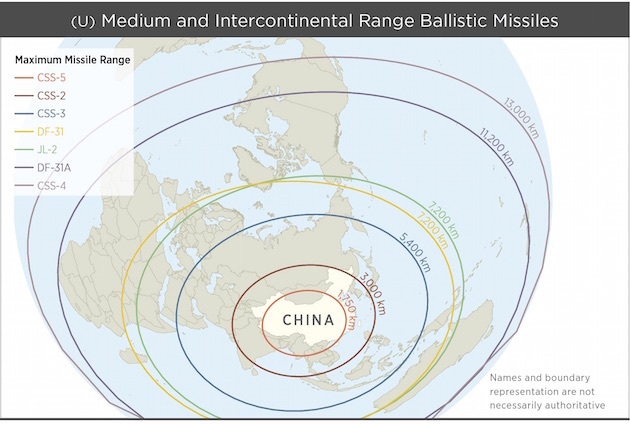 "The CSS-11, coupled with the already deployed conventional variant of the CSS-5 (DF-21) medium-range ballistic missile (MRBM), will improve China’s ability to strike not only Taiwan, but other regional targets." "A new generation of mobile missiles, with warheads consisting of MIRVs and penetration aids, are intended to ensure the viability of China’s strategic deterrent in the face of continued advances in U.S. and, to a lesser extent, Russian strategic [intelligence, surveillance, reconnaissance] ISR, precision strike, and missile defense capabilities," the report said. China asserts its policy on nuclear war is not to be the first to use nuclear arms in a conflict, but the report said there is "ambiguity" about whether or not China would be the first to fire nuclear missiles. The People’s Liberation Army is also developing military "information operations" for a future conflict that will involve cyber attacks to create an "information blockade using both military and non-military attacks against space satellites." "China’s investments in advanced EW systems, counterspace weapons, and cyberspace operations—combined with more traditional forms of control historically associated with the PLA and CPC systems, such as propaganda and denial through opacity—reflect the emphasis and priority China’s leaders place on building capability for information advantage," the report said. Offensive cyber attacks will be used to support other high-tech weapons and will strike "critical nodes to disrupt adversary networks throughout the region." China’s military has identified information warfare as "integral to achieving information superiority and an effective means for countering a stronger foe," the report said. The cyber penetrations "are similar to those necessary to conduct offensive cyber operations," the report said. The U.S. government protested the test "due to the evidence suggesting that this was a follow-up to the 2007 destructive test," the report said. "The launch profile was not consistent with traditional space-launch vehicles, ballistic missiles or sounding rocket launches used for scientific research," the report said. "It could, however, have been a test of technologies with a counterspace mission in geosynchronous orbit." The report sought to highlight increased military exchanges between the United States and China but noted that "there are still incidents that highlight the need for continued dialogue in order to reduce risk of miscalculation or misunderstanding." "The United States protested the dangerous intercept," the report said, adding, there have been no similar intercepts reported since. "The prototype, referred to as the J-31, is similar in size to a U.S. F-35 fighter and appears to incorporate design characteristics similar to the J-20," the report said. 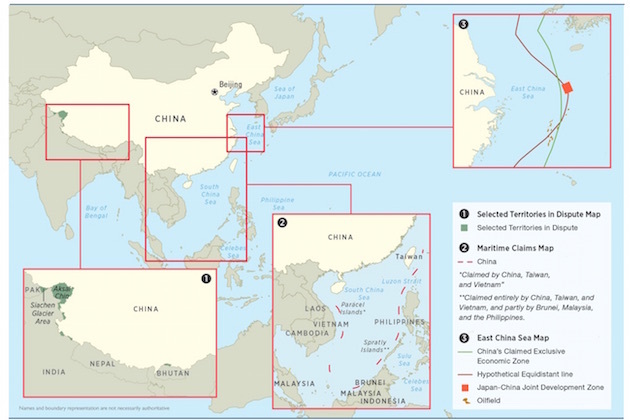 Regarding regional maritime disputes, the report said China is using its military and coast guard for "low-intensity coercion" in the South China Sea against Vietnam and Philippines and against Japan in in the East China Sea over the disputed Senkaku Islands. Chinese nationalism is also on the rise. The report said Communist leaders are exploiting nationalist sentiment among the Chinese "to bolster the legitimacy of the Party, deflect domestic criticism, and justify their own inflexibility in dialogues with foreign interlocutors." This entry was posted in National Security and tagged China, Drones, Military. Bookmark the permalink.